Huawei the Chinese company has launched yet another device into the Indian market with the launch of Huawei Honor 4X which comes after the successful launches of devices like the Honor Holly and Honor 6. The device was launched in an event organized in Delhi with Huawei saying “Get refreshed with Honor”. The Honor 4x comes with Kevlar back panel which the company says can stop a bullet which we do not know why is it important but I guess to show us that it makes the device strong. 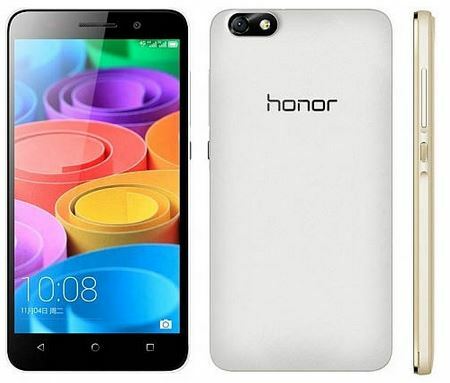 Huawei Honor 4X comes with Android KitKat 4.4 pre installed with UI EMUI 3.0 over it. Coming to the specifications and features aspect the device comes with a 5.5 inch IPS HD display having a resolution of 720×1280 pixels and runs on a 1.2 GHz Snapdragon 410 Quad-core processor along with Adreno 306 GPU supported by 2GB of RAM. The device comes with 8GB of internal memory which can be further expanded upto 32GB using microSD card slot. The device measures 152.9 x 77.2 x 8.7mm in dimensions and weighs 165 grams. On the camera aspect the devices comes with a 13MP rear camera with flash and f/2.0 aperture and a 5MP front facing camera. The Honor 4X is powered by a 3000 mAh battery which is said to give 72 hours battery life under regular use. The device has all the smartphone connectivity features like 3G, Wi-Fi, GPS, Bluetooth 4.0, 3.5mm audio jack, FM radio and dual SIM (GSM+GSM). It also comes with sensors like Compass/ Magnetometer, Proximity sensor, Accelerometer and Ambient light sensor. The company promises to send monthly OTA updates for the device for the first 6 months and later quarterly updates, which will ensure that the device wont hang up and keep the device up to date with the latest software updates. The device comes in White and Golden colors and will be available for pre-order from March 24 till March 29th mid night and will go on sale on March 30 on e-retail store Flipkart at 2PM. The device is priced at Rs. 10,499 which is reasonable for the features which are being offered.